“We are delighted to have organized an event which offered a time and place for our County’s high school students and their instructors/advisors to share ideas with one another,” noted Larry Singer, event co-chairman and Historical Society Trustee. In addition to addresses from historians and dignitaries, the students prepared short presentations for their peers about historic places in their towns/villages. These impressive and varied presentations included photo montages, videos and even a short play. The outstanding presentation award went to Spring Valley High School. Also, at the event, the HSRC provided ideas about opportunities for community service for the students in the various geographic areas of Rockland County that relate to history. Municipal Historians and local historic sites were invited to assist in suggesting these community service opportunities. Mr. Singer planned this event with the help of William Sherwood - Trustee, HSRC, Kevin Metcalf - NRHS Social Studies Coordinator and Steve Shepardson - Advisor of the NRHS Social Studies Honor Society. 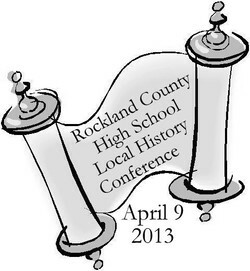 For more information about the High School History Conference, please visit: www.RocklandHistory.org or call 845-634-9629.